1. Press and release the button to turn the display feature OFF. 2. Press and release the button again to turn the display back ON. Additional options can be set with press and hold sequences of the button and are detailed below. There is a difference between magnetic north and true north. The compass in the mirror can compensate for this difference when it knows the Magnetic Zone in which it is operating. This is set either by the dealer or by the user. 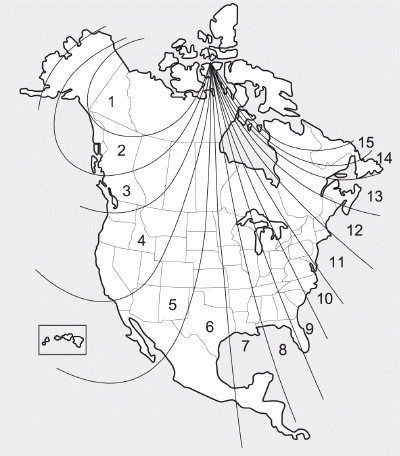 The operating Zone Numbers for North America are shown in the figure on the following section. 1. Determine the desired Zone Number based upon your current location on the Zone Map. 2. Press and hold the button for more than 3 but less than 6 seconds, the current Zone Number will appear on the display. 3. Pressing and holding the button again will cause the numbers to increment (Note: they will repeat …13, 14, 15, 1, 2, …). Releasing the button when the desired Zone Number appears on the display will set the new Zone. 4. Within about 5 seconds the compass will start displaying a compass heading again. 1. Press and hold the button for more than 6 seconds. When the compass memory is cleared a "C" will appear in the display. 2. To calibrate the compass, drive the vehicle in 2 complete circles at less than 5 mph (8 km/h). The HomeLink® Wireless Control System provides a convenient way to replace up to three hand-held radiofrequency (RF) transmitters with a single built-in device. This innovative feature will learn the radio frequency codes of most current transmitters to operate devices such as gate operators, garage door openers, entry door locks, security systems, even home lighting. Both standard and rolling code-equipped transmitters can be programmed by following the outlined procedures. Additional HomeLink® information can be found at: www.homelink.com or by calling 1-800-355-3515. Before programming HomeLink® to a garage door opener or gate operator, make sure that people and objects are out of the way of the device to prevent potential harm or damage. Do not use HomeLink® with any garage door opener that lacks the safety stop and reverse features required by U.S. federal safety standards (this includes any garage door opener model manufactured before April 1, 1982). A garage door that cannot detect an object - signaling the door to stop and reverse - does not meet current U.S. federal safety standards. Using a garage door opener without these features increases the risk of serious injury or death. Retain the original transmitter of the RF device you are programming for use in other vehicles as well as for future HomeLink® programming. It is also suggested that upon the sale of the vehicle, the programmed HomeLink® buttons be erased for security purposes.